Today’s topic is a motivational quote that is often falsely attributed to Edgar Allan Poe. Unfortunately, the misattributed version is wildly popular across the internet. 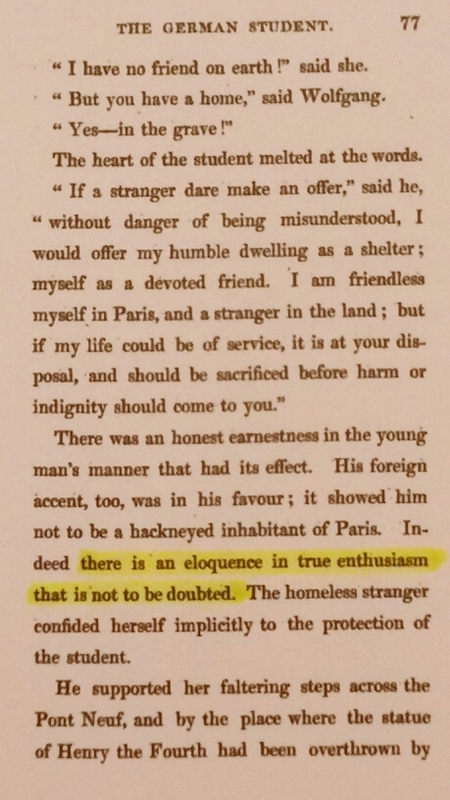 Here is the quote found in the short story “The Adventure of the German Student” by Washington Irving. Today’s misquote has a serious case of quote virus infection. It has contaminated a multitude of websites as well as modern books. I surveyed 130 infected websites and found the following statistics. As in all my previous posts, the majority of websites featuring the misquote are websites dedicated solely to providing quotes. Out of the 43% only six sites featured other non-quote information. Once again, the lesson is do not rely on quotes websites for accurate quotes. I know it doesn’t make sense that they are the least reliable since their sole purpose is to provide quotes. Unfortunately, the administrators of these sites do not check the accuracy of the data they are providing, and many simply copy information verbatim from other inaccurate websites. In fact many quotes websites contain the exact same quotes, the exact same misquotes with the exact same typos in the exact same order found on other quotes websites. And as I’ve mentioned before, these types of websites continue to multiply like a virus. Each time I do research for my next blog post, I notice new duplicate websites rearing their ugly heads. There are many books that feature the writings of both Edgar Allan Poe and Washington Irving. Most of these books are collections of ghost stories or tales of the supernatural. Some are collections of works by authors from the same time period or from the same country. Since Poe and Irving happen to be grouped in several categories together, they are both often found within the same anthology. One could surmise that perhaps a quote was taken from one of these collections and was inadvertently attributed to the wrong author in the collection. This is a complete guess on my part, but I’m basing it on past experience with multiple authors found within the same book. See my previous post dated 10/21/14 titled “Who wrote it? Wordsworth or Michelangelo?” as well as my post on 08/12/14 titled “Another Erroneous Inspirational Quote—Another Method of Origin.” These two posts support my theory. As my statistics indicate, social media is the second most popular category of website featuring today’s misquote. The reason these sites play a major role in misquote propagation is they all feature some type of functionality to forward and re-post messages and images that users create. For example, one Twitter user can create a cascade of re-tweets from a single tweet of a misquote. In other words, the misquote travels from one person to multiple people who then forward it to multiple people who then forward it to multiple people and so on. This is why I call it a quote virus. Its propagation is very similar to a physiological or computer virus. Social media together with quotes websites are the fuel propelling the spread of false information at an increasingly rapid pace. I came across two books featuring today’s misquote. Both were published in 2010. One is a book of strictly quotes. The other is a book containing a chapter dedicated to quotes. Neither of these books provides detailed source information for each quote; the author/orator’s name is the only information given. This leads me to repeat my warning to be extra cautious when using quote books published after the birth of the internet. Most of them are compilations of quotes found either on the internet or in other contemporary quote books. Do not trust a book if the quotes do not include source information such as book title, chapter, play title, act, scene, poem title, line number, speech date, location, etc. This applies to all books regardless of publication date. The most disappointing discovery to me is that this misquote appears on academic websites for schools and universities. Because information released from an educational institution or an educator is presumed to be current and accurate, a misquote disseminated from these types of sources might as well be gospel. I actually came across two teachers who not only misattributed the quote to Poe but they also misspelled his middle name. Additionally, I found an article produced by a writing consortium at a prestigious university featuring the same errors. It is disconcerting that well-respected sources of information and knowledge play a part in misquote propagation. Although I am amused, I am also saddened by the following. I came across a blogger whose home page title is “The Future Star of the Literary World,” and on the same page she cites Irving’s quote as being from The Raven by Edgar Allan Poe. 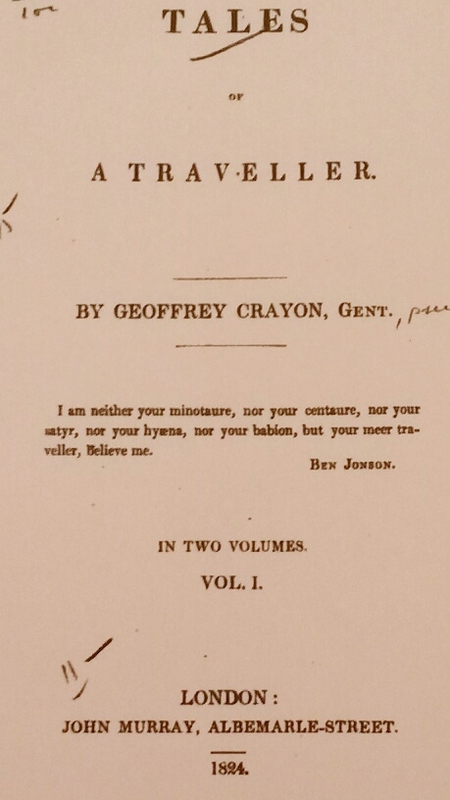 I came across another blogger who refers to herself as a “Poe Girl” on her title page, and underneath this title is Irving’s quote misattributed to Poe. As with many of my previous posts, today’s misquote is available for purchase. For just $6.50 you can purchase one greeting card, or for $20.95 you can have your own coffee mug. Not only do both items feature this very special misquote, but both come with Poe’s name misspelled and as a bonus the word “eloquence” is misspelled. Be sure to place your order soon while supplies last! In conclusion, I will reiterate my admonition to never trust a quote from a quotes website, and never trust a quote found on social media. Always make sure the quote is from a reliable source. Please visit my “What You Can Do” page for a complete list of pitfalls to avoid. ← Who wrote it? Wordsworth or Michelangelo?